These Apps Are Going To The Birds, And People Who Watch Them : All Tech Considered Technology is finally catching up to the ancient pastime of bird watching. Cell phones are already helping bird watchers get the word out on rare sightings and, soon, watchers will also have apps that forecast bird migration and identify birds by their songs. 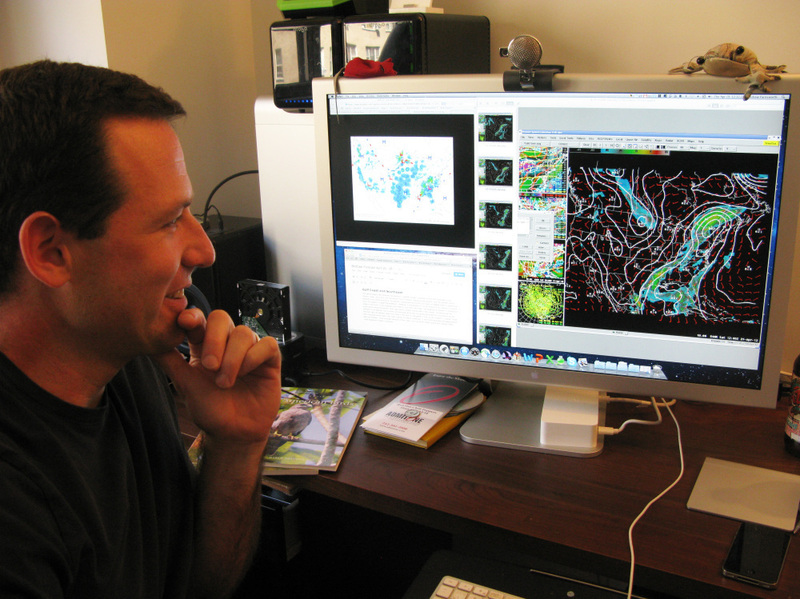 Cornell University's Andrew Farnsworth compiles data to forecast where birds are going and when they'll be there. I'm standing in the Manhattan office of Andrew Farnsworth, a research associate at Cornell University's ornithology lab. Farnsworth is using meteorological data, radar data, crowd-sourced eBird data and acoustic data from the flight calls of migrating birds to predict where birds are going and when they'll be there. It's all part of BirdCast, a project funded by the National Science Foundation. Eventually, it will be a website and an app, but you can see the posts now on Cornell's eBird site. I tell Farnsworth that I'm going bird watching in Central Park in a few days – what can I expect? He tells me southerly winds will be favorable to migrating birds that day, and there will be no rain. Two days later, I am in Central Park with Starr Saphir, who's been an avid birder for more than six decades. She arrived early that morning because, she says, "We knew that this would be an absolutely great day." But here's the difference technology makes: Twenty years ago, if you saw a good bird, you might tell other people in the park or call someone to tell them about it later that night. Now, with cell phones, text messages and email, you can hear about a bird sighting across the park and be there to see it for yourself in just a few minutes. 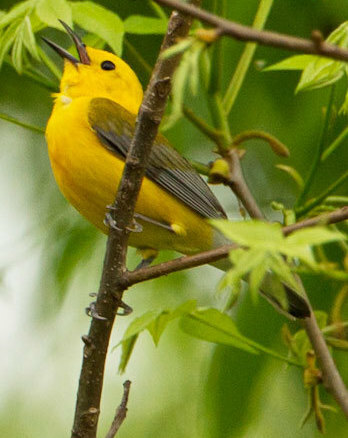 On a recent Saturday, the Prothonotary warbler drew crowds of plugged-in bird watchers in New York's Central Park. Saphir's phone rings. There's a male Cape May warbler just up ahead. Soon our group is walking quickly in the direction of the warbler. 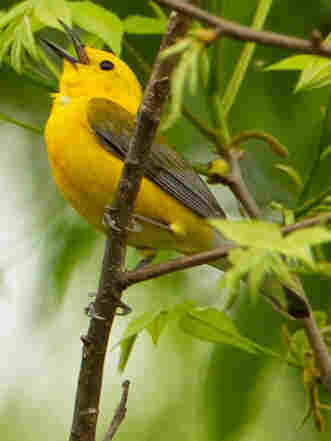 Earlier, we were led to a Prothonotary warbler, where we ran into 30 birders — news of the sighting had spread fast. An easy way to find birds is to know their calls. There have long been recordings of bird songs, but what's different now, Farnsworth says, is that apps allow you to carry thousands of those bird songs in your pocket. "You can bring it into the field and compare it to what you're actually hearing and seeing," he says. The National Audubon Society app, for example, has seven different calls for a scarlet tanager. In the future, you'll also be able to do the reverse — hear a bird song and identify it with an app, just like people identify music with apps like Shazam. That's exactly what Mark Berres, a professor at the University of Wisconsin-Madison, is trying to do with WeBird. But Berres says identifying bird calls is much harder than identifying popular songs. "When I turned it onto bird songs, it just failed miserably," he says. But, after a year of work, Berres expects the app to be ready next spring. But Does It Make Bird Watching More Accessible? You can find bar charts on Cornell's eBird website that tell you when a species migrates to your area and when it will arrive. The technology has "lowered the barriers to entry and made it easier for people to quickly get the information that they [want] when they see a bird," says Chris Wood, who runs the eBird project at Cornell's ornithology lab. He says when he started bird watching in Colorado, he was sure that he had a tricolored blackbird in his backyard because it looked a lot like the bird in the book. It took him three years to realize that there are no records of tricolored blackbirds appearing outside the West Coast. Today, that might only take an hour. Saphir doesn't own a computer, but she says the downside to all this technology is that it puts an inexpensive hobby out of reach for many. "You have to have thousands of dollars worth of equipment," she says, such as cameras, computers and smartphones. Saphir makes do with very good binoculars and, yes, a cell phone. It rings again — there's been another sighting. "OK, I'll be right there," Shapir says, and off we go.